Ryan Nafziger was born in Bloomington, Illinois but grew up in Louisville, Kentucky. In 2012, he graduated from Bellarmine University with a degree in Arts Administration. While an undergraduate, Ryan was an active participant in Bellarmine University’s mock trial team, serving as Co-President his senior year. After graduation, Ryan took a year off of school to teach English to high school students in Nanchang, China. The next year he returned to Louisville and attended law school at the University of Louisville. 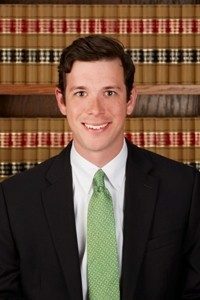 While in law school, Ryan was a member of the National Moot Court Team, The Intrastate Mock Trial Team, and worked as an Admissions Coordinator. He graduated with honors in 2016. In addition to the practice of law, Ryan continues to stay involved in mock trial, serving as an assistant coach to the University of Louisville Intrastate Mock Trial team. He also enjoys local art, music, University of Louisville athletics, and waking up early on Saturday mornings to watch soccer.